PRESS RELEASE: Pearl is introducing a new Limited Edition VSX drum set exclusively for Europe. This VSX drum kit is equipped with a special designed graffiti graphic by Pearl. The set comes with a 22"x18" un-drilled bass drum, 10"x7" and 12"x7" toms, 14"x12" and 16"x14" floor toms and the Sensitone Steel Snare drum. All will be complemented with our new 890-Series Hardware Pack. Based on the original Vision formula, Pearl VSX drum kits feature blended Birch Ply shells with 6/8 shell technology. Lower frequencies require greater energy to project equally to match the high frequencies produced by smaller drums. 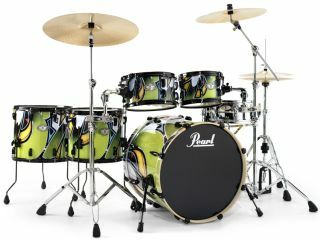 Vision's combination of six-ply rack toms and eight-ply floor toms and bass drums deliver a dynamically balanced sound. Pearl offers 9 standard Vision configurations, more than any other drum manufacturer. VSX comes with a Brushed Steel SensiTone snare. Standard in the VSX finish line up Pearl offers 6 Ultra-Exotic wrapped coverings.